Despite ongoing attention given to pathogens within the class Epsilonproteobacteria, environmental members are still among the most poorly characterized bacteria. We discovered novel Epsilonproteobacteria all over the world in hostile, sulfur-rich environments, including caves and deep-sea hydrothermal vents. In 2006, we proposed the classification of the family Thiovulgaceae fam. nov. for a large group of terrestrial and marine, environmentally-retrieved sequences (Campbell et al. 2006). However, most of the lineages from terrestrial settings are without cultured representatives and are underrepresented compared to marine-affiliated lineages. There are also unresolved evolutionary relationships between lineages found in cold and hot habtiats, and between lineages found from freshwater versus saline habitats. Our long-term goal for this project has been to identify and resolve the taxonomic patterns of environmentally-derived Epsilonproteobacteria, and specifically those from terrestrial groundwater systems, so that we can better understand their ecological and geological significance in modern settings. The importance of Epsilonproteobacteria to carbon, nitrogen and sulfur cycling, is just beginning to be appreciated, and our research addresses questions regarding species diversity and microbial interactions with the environment. Onging and future research focuses on what can be learned about metabolism and mutagenicity from Epsilonproteobacteria living in low-temperature, terrestrial habitats. Certainly, some of the poor evolutionary resolution between the marine and terrestrial lineages at present is because most newly identified lineages within this class are without cultured representatives and have only been described from 16S rRNA-based phylogenetic studies. Headd, B., Engel, A.S. (2014) Congruency among bacterial communities from terrestrial sulfidic springs. Frontiers in Microbiology. DOI: 10.3389/fmicb.2014.00473. Headd, B., Engel, A.S. (2013) Evidence for niche partitioning revealed by the distribution of sulfur oxidation genes collected from areas of a terrestrial sulfidic spring with differing geochemical conditions. Applied and Environmental Microbiology. 79: 1171-1182. DOI:10.1128/AEM.02812-12. Birdwell, J.E., Engel, A.S. (2010) Characterization of dissolved organic matter in cave and spring waters using UV-Vis absorbance and fluorescence spectroscopies. Organic Geochemistry, v. 41, p. 270-280. 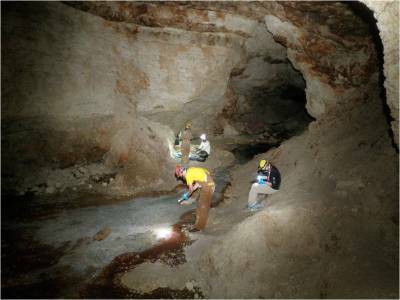 Engel, A.S., 2010, Microbial diversity of cave ecosystems, in Barton, L.L., Mandl, M., and Loy, A. (eds. ), Geomicrobiology: Molecular and Environmental Perspective: Springer. DOI:10.1007/978-90-481-9204-5_10. Engel, A.S., Meisinger, D.B. Porter, M.L., Payn, R., Schmid, M., Stern, L.A., Schleifer, K.-H., Lee, N.M. (2010) Linking phylogenetic and functional diversity to nutrient spiraling in microbial mats from Lower Kane Cave (USA). The ISME Journal, v. 4, p. 98–110; doi:10.1038/ismej.2009.91; published online 13 August 2009. Porter, M.L., Engel, A.S., Kane, T.C., and Kinkle, B.K. (2009) Productivity-diversity relationships from chemolithoautotrophically based sulfidic karst systems. International Journal of Speleology 38, 27-40. Birdwell, J. and Engel, A.S. (2009) Variability in terrestrial and microbial contributions to dissolved organic matter fluorescence in the Edwards Aquifer, Central Texas. Journal of Cave and Karst Studies. v. 71, p. 144-156. Porter, M.L., and Engel, A.S. (2008) Balancing the conservation needs of sulphidic caves and karst with tourism, economic development, and scientific study: Cave and Karst Science. 35:19-24. Engel, A.S. (2007) On the biodiversity of sulfidic karst habitats. Journal of Cave and Karst Studies, v. 69, p. 187-206. Campbell, B.J., Engel, A.S., Porter, M.L., and Takai, K. (2006) The versatile Epsilonproteobacteria: Key players in sulphidic habitats. Nature Reviews Microbiology, v. 4, p. 458-468. Brannen, K.M., Engel, A.S., Birdwell, J.E., 2010, Creating humic matter indices for the interpretation of ecosystem energetics, in International Training Workshop on Organic Matter Characterization Using Spectroscopic Techniques May 19-21, 2010 - Granada, Spain, p. 1-2 (poster abstracts) http://spectroscopyworkshop.weebly.com/poster-info.html. Donnelly, B.M., Huber, K.G., Brannen, K.M., Bergeron, P.G., Mulec, J., Rossmassler, K., Campbell, B.J., Engel, A.S., 2008, Karst field school and research experience: undergraduate involvement in the 16th International Karstological School and geomicrobiology research in Slovenia. Geological Society of America Abstracts with Programs: 40, 368. Engel, A.S., Porter, M.L., and Campbell, B.J., 2007, Karst as a model system to examine terrestrial microbial biogeography patterns through time: An example from the Epsilonproteobacteria [abstract for Time in Karst meeting, Postojna, Slovenia]. Acta Carsologica, v. 36, p. 212-213. Headd, B., Campbell, B.J., Engel, A.S., 2010, Differentiating among the dominant and rare microbial groups from sulfidic terrestrial springs, The 13th International Symposium on Microbial Ecology, Seattle, WA. Mulec, J., Engel, A.S., Oarga, A., Rossmassler, K., Campbell, B.J., and Sebela, S., 2009a, Microbial diversity from the sulphidic karst spring, Žveplenica-Dolenja Trebuša, Slovenia, in White, W.B. (ed. ), Proceedings vol. 1, Symposia part 1, 15th International Congress of Speleology, p. 399. Mulec, J., Engel, A.S., Walochnik, J., Oarga, A., Kosi, G., and Klemenčič, A.K., 2009b, Microbial life along environmental gradients in karst habitats. Sulfidic Karst Ecosystems conference, Genga, Italy, Sept 11-14. Porter, M.L, and Engel, A.S. (2009) Energy flow and productivity-diversity relationships in chemolithoautotrophically-based ecosystems, in White, W.B. (ed. ), Proceedings vol. 1, symposia part 1, 15th International Congress of Speleology, p. 404-405. Rossmassler, K., Engel, A.S., Campbell, B.J., (2008a) Biogeography and phylogeny of Epsilonproteobacteria in sulfidic environments, in Kato, K., and Kimura, H., 7th International Symposium for Subsurface Microbiology, Shizuoka, Japan, p. 229. Rossmassler, K., Engel, A., and Campbell, B. (2008b) Epsilonproteobacteria and microbial communities in cave environments. In JAMSTEC. Tokyo, Japan. Rossmassler, K., Engel, A.S., Campbell, B.J. (2009) 23S rRNA phylogenies and whole genome amplification reveal increased diversity among Epsilonproteobacteria from sulfidic caves and springs. American Society for Microbiology 109th General Meeting, Philadelphia, PA; pp. 359-360. American Society for Microbiology: Washington, DC; Abstract N-125. Rossmassler, K., Engel, A. S., Hanson, T., and Campbell, B. (2010). Biogeography of Epsilonproteobacteria in sulfidic caves and springs based on the 23S rRNA gene. 21st Annual Saint Joseph's University Sigma Xi Student Research Symposium, Philadelphia, PA.
Rossmassler, K., Engel, A. S., Hanson, T., and Campbell, B. (2010). Biogeography of Epsilonproteobacteria in sulfidic caves and springs based on the 23S rRNA gene. The 13th International Symposium on Microbial Ecology, Seattle, WA.